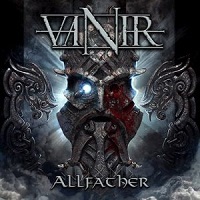 With a look that resembles a group of warriors coming straight from a skirmish instead of a musical ensemble, VANIR is a band dedicated to Viking culture. Expressed through some of the best Death, Folk and even Progressive Metal songs that I have heard in a long while. This had the special distinction of being the first review that I have ever done completely disconnected from the world wide web. This created an intimacy in which this record was reviewed, that Idare say, allowed me to feel the sea salt while on my way to plundering, raiding and just plainly searching for my way into Valhalla. "Allfather" is an eleven tack record that entwines excellently drafted and crafted musical production, performance and composition all into one. This allows an amalgam between the best of ancient folklore and top of the notch production to make "Allfather" an outstandingly achieved product of artistical evoking. Indeed, the concept and imagery accompanying the video of "FEJD" is worth the whole experience of getting to know this band hailing from Roskilde, Denmark. This is their fifth full-length album paying homage to Odin. Every note played and every word sung is to honor and share their heritage to all the world in a way that would surely make the Danish ministry of culture prouder than any boring National Geographic documentary ever done before. So board the drakkar and dare to go where few men have gone before. This is obviously a different route filled with riches, wealth and Metal glory. But do not forget to give a portion of your spoils and plunder to the Metal Temple. It is crucial to keep the vault overflowing with new material that will make your travel to your favorite places and times through the power of music. This record did just that. Not only in a time of darkness as a guiding light, but also as a way of nourishment and inspiration in a time of need. All hail the Allfather in his might.